Many of you responded to my post "Win one of 7 new high performance flex pens" a while ago, and I was very pleased you took the time to reply to such an exhaustive survey. Well, I've been working like a dog making a lot of mistakes these past few months, and at last, here are a few ideas in the form of flex fountain pens I think you'll enjoy. You've probably already seen the writing samples I've posted in the poll posting, so I won't burden you with another one here. User testing was very positive so far. Now, we get to talk about design. Otherwise, chime into this thread with what you'd like. I want to make these pens affordable, so if you're lusting after 14k gold flex, or lots and lots of metal in your pen, you'd probably be better off going vintage. That said, I have lots of ideas I want to make, and your comments will significantly help me refine my thoughts. The webstore is on its way, and if you like what you see, please comment! Loving the black one that looks like it has an ink window . . .
Do you have any other close up pics of the nib & feed? What type of filling mechanism do they have? Back row from left, I like #s 1,2, 4, & 5. Up front? The one to the far right really does it for me. Would love to see close-ups of some of these, as well as nib shots. I am not on facebook, but checked out the home page. Love the logo. Reminds me of Frank Lloyd Wright. And you being in Chicago, well, seems appropriate. I like it for its simplicity,and it seems like it would look cool on a nib. Well, I look forward to being able to purchase one of your pens. I like the idea of flex, as well as something firmer (but not a nail). 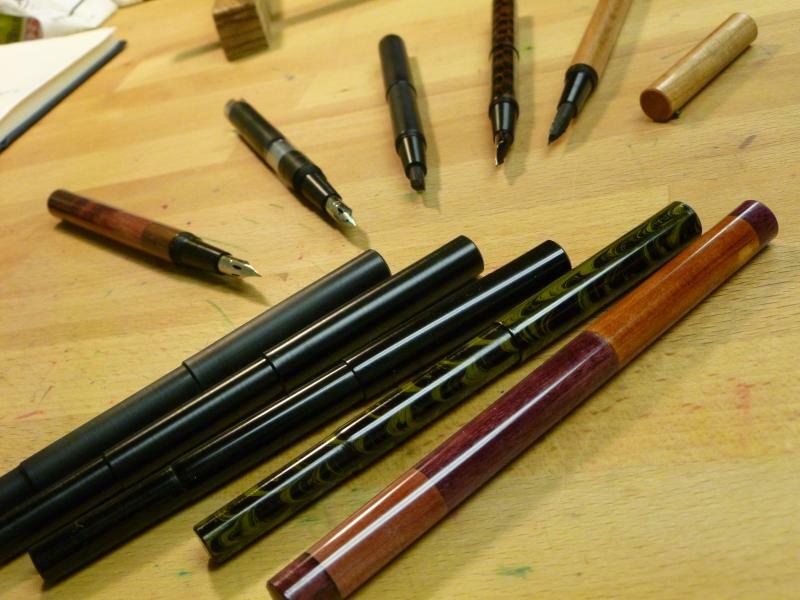 Give a holler if you run up any more wood test pens and you want to have it test driven by a lefty. Heck. I'd even throw money at it. Good luck on your venture. My favorite would be the Cedar/purpleheart, beautiful pen! 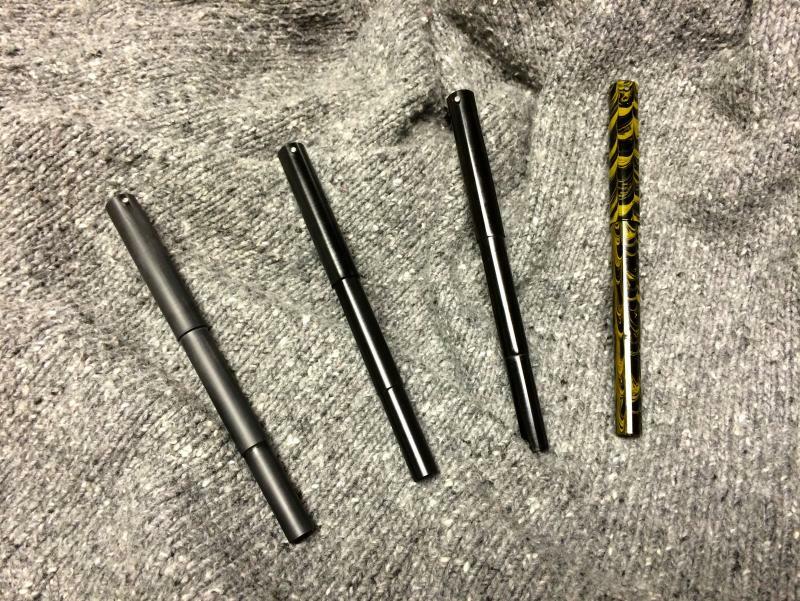 Very nice looking pens, good job! I like the roll stoppers and the unique design. My favorite color is the two-tone wood color one. +1. Ink windows are a big deal for me. I would buy one of these. I'll repeat myself from the Facebook comments-- the alternating woods at the front of shot is extremely arresting, but it has only the slightest of advantages on the others. Ebonite and flex! Are the wood barrels sealed to keep ink out? As a "user" pen the Delrin makes sense for easy cleanup, but let's be honest, those wooden barrels are beautiful! I personally love tools and pens made from wood. They feel warm and lovely, and no two are the same because each piece of lumber is always slightly different. So I am adoring the selection of wood barreled pens you have crafted! Some more exotic lumber such as tiger maple would be breathtaking with your pen turning skills! Seeing that you are in Chicago, are you going to have a physical store location, or are you only going to be selling online? I am not unfamiliar with Chicago, and have family and friends there, so I return to the city from time to time. Edited by Taiin, 08 July 2014 - 16:17. No B&M planned. Thanks for the compliment! Let me know when you're in Chicago again, and email me. We could talk. You mean it's the nicest one, but only slightly more so than the others which are also very nice? Thank you very much! Those wooden pens are a lot of sweat to make, but the results seem to be worth it. How do you feel about solid colors? Not yet. Eyedropper or aerometric bulbs. "Thank you very much! Those wooden pens are a lot of sweat to make, but the results seem to be worth it. How do you feel about solid colors?" I like solid colors just fine as well. Especially when it is an interesting wood. And there is a lot of that around. I like the idea of an aerometric bulb filler. I have hot hands and can make pens blop ink, especially narrower pens. Looking forward to see what's next. My 2 cents: bulb fillers are a pain, neveruse mine and it's attached to my best nib. I love the size of old ( vintage ) pens. They fit my hand better. I selfishly hope that some pf these will be small and light. Any of them that are green. Actually they are all gorgeous. I would love to purchase any of them (especially green) and would be delighted to use them. Actually my wife would love a modern flex so it would most likely go to her. Keep up the great work. Oh, and keep the eyedropper filler as it will be needed with any decent amount of flex. Are these pens going to be like Ackerman pen but without pump and with different filling system? I have Ackerman's pump pens and fountain pen (their eye dropper version), and although they do work well they are a bit cheap looking, so prettier pens using similar concept will be welcome. What I have noticed with Ackerman pens is that even though Nikko/Zebra/Tachikawa G nibs are chrome plated, and will last much longer than regular steel dip pen nibs, they are still prone to rusting and discolouring over time. I have kept my Zebra and Nikko nibs in the two pump pens for 3 or 4 months with iron gall ink in the pen, and noticed some rusting starting along the nib tines up to the breather hole. Admittedly iron gall inks will promote corrosion more than pH neutral inks but I know that there are pretty acidic non-IG inks out there too. I now always take the G nibs out when I know that I won't be using the pen within a few days. But then again, the replacement G nibs are pretty affordable so that may not be a big issue. I see that there will be several varieties of nibs to be offered. Will you be offering fully plated, better corrosion resistant nibs? I like the look of all of them, especially the greenish yellow and black marble one, but maybe black is my least favourite, because I like pens with pretty colours! I look forward to your new pen offerings. Please keep up the great work and I will make sure to be keeping an eye out for new developments. Edited by SNAK, 09 July 2014 - 02:02. As far as I've seen, most reasonably priced flex pens are resin or metal (both vintage and current). Offering flex pens in wood will probably help set your brand apart too. That's so sweet! You'll have the option of stainless steel vintage flex, but those will come at a price premium. I love the Zebra G, but I'm also very fond of the GIllott 303. I take good care of my Zebra G, and I can get months out of it. When neglected, it still lasts several weeks before anything crazy happens. What are the nibs + the price range of the pens? They all look gorgeous, but the brown ebonite, demonstrator, and the matte black delrin pen are especially so. If anybody wants to buy a FPR triveni, a waterman's crusader with a modified barrel, or faber castell pitt brush pens I have one just for you! Do your flex nibs rival with Omas super flessible nibs?? ?